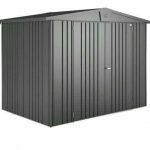 The 8 x 6 Waltons Apex Metal Shed is a strong and long lasting shed that is sure to be ideal for those looking for some extra storage space. Despite being in the discount sheds section, this shed is a very good size. Offering you a good amount of room to keep things like gardening equipment, children’s garden toys, bikes and even large lawn mower safe from thieves and the elements, the storage space offered does not come at the expense of your garden as this does not actually take up a whole lot of space. You will be able to get in and out of the shed easily as there are two large doors and the rain will never be an issue thanks to a smartly designed apex roof. 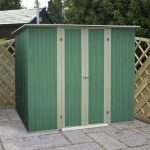 This shed is made with high quality and powder coated galvanised panels. 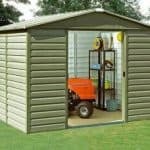 These panels can take a real beating and they do not actually require much in the way of maintenance, which is great if the idea of treating a shed is something you hate the thought of. The whole structure due to the way it has been designed has a very robust feel to it. This along with the good looks and low price make this a shed we are sure many people are going to be interested in. As far as discount sheds go the 8 x 6 Waltons Apex Metal Shed is one of the smartest looking ones that we have seen. This metal shed has a very striking look to it. While the one in the picture is green and grey, Waltons have recently announced that the newer models of this shed are all green. 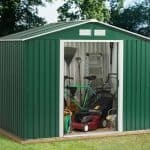 This is a good mid sized shed that at 8 feet wide and 6 feet deep gives you plenty of storage space for things like tools, gardening equipment, a lawn mower or even as a space to toss the kids summer garden toys. The height of the shed is 6 feet 3 inches along the ridge and 5 feet 9 inches at the eaves. This is more than enough headroom to make getting all the way to the back no trouble at all. The roof is made with the same kind of galvanised panels as the rest of the structure. They have gone for an apex roof and interestingly the angle is not quite as steep as we are used to seeing, but do not worry as the rain will still run off at the sides and not down the front of the shed. With the 8 x 6 Waltons Apex Metal Shed being a metal shed there is of course no cladding. But even though we have this in our discount sheds section, it is still very well made. The walls are made using galvanised metal panels that are very strong, but also quite lightweight which will make installation very easy. A metal shed most of the time does not have what you would class as a frame inside of it. Now this is not actually something you need to worry about as a metal shed is designed to secure together well enough that there is no need for a traditional frame. The roof however does have a little bit of extra support. There is no floor included with this shed. The idea of a shed like this is that you will fix it directly to a concrete surface. This is easily achieved thanks to the free anchor kit that comes with the shed. If you do not have a concrete area in your garden then you will have to make arrangements to have some kind of floor as we really do not think installing this on grass would be a good idea. 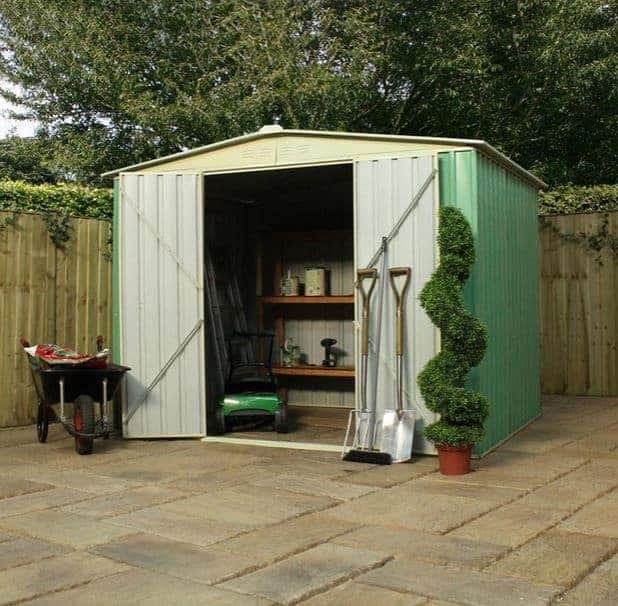 As we mentioned before the 8 x 6 Waltons Apex Metal Shed is made with galvanised metal panels. The colouring on these is powder coated so this means it is very low maintenance. As a matter of fact if you do not mind it looking a bit dirty and dusty, you actually never need to give it any care at all. If you did want to keep it looking clean though that is as easy as just turning the garden hose on it once in awhile. This metal shed comes with a one year manufacturers guarantee. This does come across as very short, considering most of the other discount sheds we have looked at come with a 10 or 15 year guarantee. As you can see from the pictures, getting in and out of this shed is going to be no trouble at all as there is a fantastic set of double doors on here. At 2 feet 8 inches wide and 5 feet 9 inches high, the doors are a good enough size that getting things as awkward as a mower or a bike into the shed will be no trouble at all. Your kids will no longer have any kind of excuse for just leaving their bikes on the lawn. The 8 x 6 Waltons Apex Metal Shed does not actually come with any windows. Now to be fair this is the case for most metal and discount sheds as it is a way of keeping costs down. A lack of windows on a metal shed is something that never really worries us so we would not put the shed down for that. This is one very secure and solid shed, especially considering it does not actually come with any kind of lock. 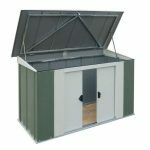 When all bolted and screwed together, the 8 x 6 Waltons Apex Metal Shed is a very robust structure that will have a solid feel to it as most metal sheds do. Even for a discount shed this one is very strong. The door does come with a high quality pad bolt which is going to keep them securely closed. Also the doors are bolted onto the shed with these very strong and long lasting hinges. Adding a padlock for some extra security would be no trouble at all and also very cheap. As there are no windows, you do not have to worry about people looking inside the shed, this is of course as long as you or the kids do not leave those doors swinging open. The lack of windows means that you will feel more comfortable storing expensive items inside here as there is no way for people to see them. 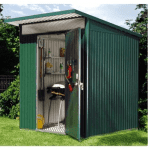 As is the case with most metal sheds, you do not have any customisation options here. The shed will come to you in its green colour and that is that. Do not worry though as this is one very smart and modern looking shed. Surprisingly they are not offering any extras at all with the 8 x 6 Waltons Apex Metal Shed. It comes with the anchor kit so unless you do not have a concrete floor then there is not really anything you need to think about purchasing to go along with this. Apart from some awesome new tools of course, a new shed is always an excuse to get some fun new toys! We are very pleased with the overall quality of this shed. It is strong, long lasting and in general we feel they have done a very good job in making a good quality, but low priced shed. This is a very long lasting shed that is going to give you many years of use and require next to no TLC from you in return. The galvanised metal that they have used is designed to take a beating from the elements so it can handle whatever comes its way. 8 x 6 may not be large, but this is an ideal size for those who just need a place for general garden storage. This is much easier with two people and just requires some bolting and screwing. A person with average DIY skills should have this up and ready for action in 6-8 hours at the very most. We do feel the asking price is fair if you already have a concrete floor to use. If not then it may get a little more expensive trying to figure some kind of flooring out. Final Thoughts: We think that the 8 x 6 Waltons Apex Metal Shed is one of the more different looking discount sheds we have looked at. It has a very modern look to it and we in general feel that the green they have gone for is a very nice colour. It is going to provide you with an ideal amount of storage space and the asking price is very, very reasonable. In general this is a garden shed that we really like and feel Waltons have done a great job, but keep in mind that if you do not have a concrete area in your garden to secure this, that getting a floor can be something of a headache. Still if you can deal with that, you are going to be very happy with what this shed provides.